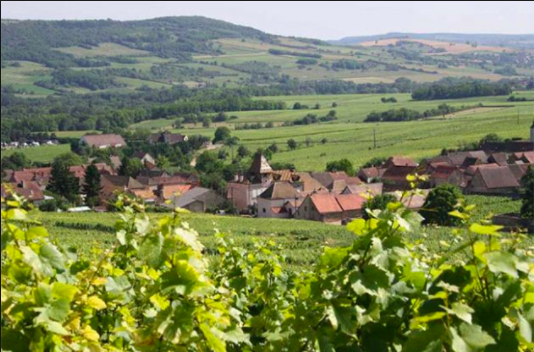 Maison Pierre Sparr is one of the oldest wineries in Alsace, founded in 1680. Generation after generation they have followed there their philosophy that “the quality of a fine wine already exists in the grape.” In other words, the quality of a wine is determined by its vineyard origin. This wine is made from some of the best Granite, limestone, gneiss, and chalky-clay vineyards in Haut-Rhin and Bas-Rhin creating this classic Alsatian Riesling at a great value $13.99. The nose is pure Alsace, with notes of paraffin, bright citrus and peach. Medium light in body with flavors of citrus and green apple that are met with minerality, and acidy that carries thru to the finish that lingers for just a while, making the drinker want to take another sip. Critical acclaim from the Wine Enthused had this to say about it “WE90 the ripeness of Mirabelle plums and the satisfying tartness of ripe Cox apples are met on nose and palate by wonderfully fresh lemon notes. The citrus zestiness works its way through the slender dry body all the way to the lip-smacking, fresh and even brisk finish”. This wine is great for cheese. Crusty bread cubes; steamed broccoli or cauliflower; carrot, celery or fennel sticks; cubed apple; seedless grapes; clementine sections; cubed salami, soppressata or kielbasa; roasted chestnuts and/or dried apricots. Step 1, Rub cut side of garlic on inside of large Dutch oven or heavy-bottomed saucepan, preferably cast iron, rubbing the bottom and halfway up the sides. Add wine and bring to a simmer over medium-high heat. Step 2, meanwhile, in a large bowl, toss cheeses with cornstarch. Add a handful at a time to simmering wine, stirring until first handful melts before adding next. Reduce heat to medium and stir constantly until cheese is completely melted. Add kirsch, if using, and heat until bubbling, about 1 to 2 minutes. Season with salt, pepper and nutmeg, if desired. Up to 6 Tbsp. milk, as needed (for a slightly richer dressing sub 2 Tbsp. olive oil for some of the milk). For the dressing, add all dressing ingredients except for milk to a food processor. Pulse until well blended then add in milk 1 Tbsp. at a time to reach desired thickness. Store in refrigerator in an airtight container. For the salmon, preheat a grill over medium-high heat. In a small bowl whisk together chili powder, cumin, paprika and onion powder. Brush both sides of salmon with olive oil then season both sides with salt and pepper then sprinkle spice mixture evenly over both sides of each fillet. Dip a paper towel in olive oil then using long handled tongs, brush grill with olive oil. Add salmon to grill and cook about 3 minutes per side, or to desired doneness. Remove from grill and squeeze fresh lime juice over tops. Mt. Beautiful lies in the heart of North Canterbury, on the South Island of New Zealand, where cool a maritime climate combines with Phoebe soils (silt loam and light clay on top of a mudstone foundation which is covered by alluvial gravel) to create conditions that are ideal for growing sauvignon blanc that’s uniquely different from Marlborough style wines. This wine sets a new precedent for New Zealand Sauvignon Blanc’s. You will find this one is not as tart, grassy and herbal as the Marlborough style. It has lovely tropical fruit and a subtle creaminess on the mid-palate. It has white floral tones with intense melon, mandarin orange, green apple and just a touch of herbs in the finish. It’s crisp and dry, fruity, and packed with layers of flavors. This wine is perfect for a starter on a warm summer evening and great with light fresh foods. Asparagus season is coming to an end and it can be hard to pair food with, but this wine is a great companion for it, Enjoy! Brush a 13- by 9-inch roasting pan with some of melted butter, then sprinkle shallot and zest in pan. Trim asparagus to about 7 inches long, then peel spears starting from 2 inches below tip of each. Arrange fish fillets, skinned sides up, on a work surface and season with salt and pepper. Lay 5 or 6 asparagus perpendicularly across 1 fillet and wrap fish around them to make a bundle. Repeat with remaining fillets and asparagus. Transfer bundles, seam sides down, to roasting pan and brush fish with remaining melted butter. Season with salt and pepper, then add water to pan. Cover pan tightly with foil and bake until fish is just cooked through and asparagus is crisp-tender, about 20 minutes. This is Blue Point Brewery’s twist on a light-bodied Mexican beer traditionally served with a lime. They brewed a crisp, light Lager and took care of the flavor additions for you, adding an infusion of agave nectar and a touch of local Amagansett sea salt for enhanced and brightened flavor, along with the zest of fresh limes for an added clean finish. Serve this in a well-chilled glass or mug. (I added a fresh lime wedge for a little more refreshing zing) From your first flavorful sip, you’ll see why Macho Muchacho is nacho average Mexican-style brew, super refreshing for the hot days of summer. Availability: May – August 5.5% get it while it lasts. The Château, sits at the foot of the spectacular Mount Sainte-Victoire, in the cradle of Côte de Provence. The estate produces this wonderful rose’ made from 35% Grenache, 30% Cinsault, 25% Syrah, 10% Rolle, in vineyards that, are within walking distance of, the mountains. The 2015 vintage turned out to be one of the best in recent years, helping to create this beautiful pale pink wine that has earned many glowing reviews; here just a few. Excellent-Exceptional “Bright and refreshing, with lovely watermelon and raspberry flavors, this wine successfully captures rosé’s attraction in an appealing ripe vintage.” Washington Post '” Esprit Gassier' is a simply a outstanding Rosé it instantly opens with fresh aromas of watermelon, honeydew, white peach, lemon and wet river stones. It is beautifully balanced and focused with a gorgeous texture leading up to the clean finish. This Rosé is flat-out delicious and will be almost impossible not to like. 92 points IWR. Energetic, sharply focused red berry and orange zest scents, along with a hint of fresh white flowers. Delicate and precise, offering nervy strawberry and blood orange with a long, juicy finish that shows good clarity and cut.” Vinous 90 JR. We loved this wine when we tasted it and knew it was going to be a hit at $17.99 it’s a great value as well while it lasts. First, make aioli sauce. Place garlic, mustard, egg yolks and dill in a food processor or a blender. Blend until combined. While running, slowly add the olive oil until completely combined. Pour it slowly into the top of a food processor or blender. Keep blending until you get the consistency of mayonnaise. Stop the food processor, add lemon juice, salt and pepper to taste. Pulse a few more times until combined. Scrape the sides of the bowl with a rubber spatula, pulse again. Set aside a cool spot. Season salmon and asparagus with olive oil, salt and pepper. Heat up grill to medium /high. If you don't have one a grill pan or it, a regular non-stick pan would be ok. Once it's hot, place the salmon in the pan, skin side down. I like crispy salmon skin, but if you don't like the skin, you can slice it off. Place asparagus on the grill. You can grill both salmon and asparagus at the same time if you have room on the grill. Cook salmon about 4 minutes on each side. For asparagus, depending on how big they are, flip them once or twice until they turn dark green in color. Plate the salmon and asparagus. Serve with a dollop of the aioli on the salmon and good crusty French bread, along with and a glass of Rosé. Wine is an important part of a Seder meal during the celebration of Passover signifying the liberation of the Israelites from Egyptian slavery. Four cups of wine are poured and drunk in accordance with four promises made by god found in Exodus, "I will take you out Egypt,” "I will save you from Egyptian slavery”, “I will redeem you with my power”, "I will take you as my people”. This is a wine that comes from vineyards are planted on ancient limestone terraces at an altitude of 900 meters above sea level in the northern hills of Jerusalem. Made from a blend of 49% Merlot, 36% Petite Sirah, and 15% Shiraz. This wine has a beautiful blood orange, tinted pink color with inviting aromas of melon, wild strawberry, and soft notes of limestone. Medium /light in body this wine has a clean bright attack with layered flavors of tart golden apple, and undertones of strawberry and rhubarb with subtle minerality that leads you to a lingering crisp finish. We are going to sell this wine for as long as it lasts and you will be able to find it in or kosher selection or the international the rose section all summer. ¼ cup cracked black pepper. If using fresh horseradish, peel, cut into chunks and process in a food processor, using the steel blade. Do not grate it by hand; the fumes will be overpowering. Drape the food processor with a damp towel and carefully crack the lid, under the towel, to absorb the fumes. Remove pin bones from salmon and set aside. In a large stainless steel or glass bowl, combine horseradish and remaining ingredients, wearing gloves to avoid turning your hands purple. Choose a nonreactive pan that is just large enough to hold the salmon fillet or line a pan with plastic wrap. Drizzle a little of the beet mixture on pan and place the salmon, skin-side down, on top. Cover the flesh with remaining beet mixture, making it thinner on tail and belly section and thicker everywhere else. Cover with plastic wrap, place another pan on top, and weight with cans. Cure in refrigerator for 3 days. Gently scrape off beet mixture and discard. Cut salmon in thin slices and serve. Whole fillet, well wrapped in plastic, will last 1 week refrigerated. (Note) Kosher salts are made through different processes, and as a result differ in weight. The kosher salt tested was Diamond Crystal; Morton weighs almost twice as much, so use less, about 2/3 cup. This is the kind of wine you would get, if you walked into a wine bar in Tuscany and asked to have something classic from a really good vintage. The Lilliano Chianti is made at a property that dates back to the middle ages, and once was owned by the Marquis of Tuscany. The estate is ideally situated in the village of Castellina about 15 kilometers south of Florence in Tuscany. The 2013 vintage for this area was classic to excellent. Made from a blend of 85% Sangiovese, 15% Colorino & Canaiolo. This wine was aged for at least one year in stainless steel & medium-sized barrels, then bottle aged for two to three years. Dark garnet in color this wine has expressive aromas of dark cherry, sweet tobacco and a touch of violet with a very subtle note of pinyon. Medium/light in body and very well balanced, fruit flavors of cherry & raspberry, commingle with supple spice, fine tannins and balanced acidy for a round mouth feel that leads you to a pleasant medium length finish. Decanter awarded this wine 90 point scores and said it was a lovely wine which should continue to surprise us with time. Place oil, garlic, and red pepper flakes in a medium saucepan over medium heat. Cook until fragrant and bubbles start to form around garlic, 30-60 seconds. Stir in crushed tomatoes and bring to a boil. Reduce heat to low and simmer until slightly thickened, about 20 minutes. Remove from heat and stir in basil. Season with salt and pepper. Set aside. Whisk together ricotta, 1/3 cup of mozzarella, provolone, 1/3 cup parmesan, egg, and 1/4 cup basil in a medium bowl. Set aside. Light one chimney full of charcoal. When all the charcoal is lit and covered with gray ash, pour out and arrange the coals on one side of the charcoal grate. Set cooking grate in place, cover grill and allow to preheat for 5 minutes. Clean and oil the grilling grate. Brush eggplant slices with oil and season with salt and pepper. Grill eggplant slices until browned on both sides, 2-3 minutes per side. Transfer to a large tray or cutting board. Place a heaping tablespoon of ricotta filling on wider end of eggplant slice and roll eggplant closed around filling. Repeat with remaining eggplant slices and filling.